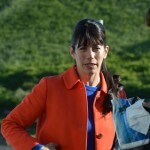 Home » Actors/Actresses » Comedy » Drama » A trip to Portwenn and the making of Doc Martin 6…. A trip to Portwenn and the making of Doc Martin 6…. As Planet Earth patiently (ha!) awaits the precise moment that surgery is once again open in Portwenn for the return of Doc Martin, David Rubinsohn and Eric Luskin, colleagues over at American Public Television, the U.S. distributor of the series to public television stations, made the trek to Port Isaac to both interview cast and shoot material for an upcoming behind-the-scenes special on public television. 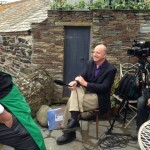 Doc Martin Revealed will air in late November, early December on a number of public television stations across the U.S. Recently, armed with a full understanding the true meaning of ‘there’s no such thing as a free lunch’, David filed this report exclusively for Tellyspotting readers from the set of Doc Martin as they were filming the upcoming sixth series of the immensely popular ITV drama series. David, you truly sacrifice for the fans of Doc Martin on public television…. Before I forget…a big Tellyspotting shout-out to the crew working on Doc Martin, including Simon the head audio tech. It was brought our attention that Simon and a number of the crew are readers of Tellyspotting. That is beyond cool. Thanks to the entire cast and crew on behalf of Doc Martin fans worldwide for doing what you do on this brilliant series. When my colleague at American Public Television, Eric Luskin, told me that we had an opportunity to shoot some behind-the-scenes footage of Doc Martin, I forced myself to get excited. To have an opportunity to go to Port Isaac to be involved with one of the best shows on television was a thrill. You can expect to see this special, Doc Martin: Revealed hitting the PTV airwaves sometime in late November or early December. 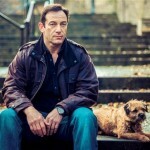 The new season, Series 6, with additional behind the scenes material also available will air early next year – 2014. After red eye flights to London, Eric and I boarded the First Great Western train to Cornwall from Paddington Station in London. The destination: Bodmin Parkway, some place four hours southwest in beautiful Cornwall. From there our driver, Paul, drove us another half hour to our destination. And there it was – Port Isaac which is, in my opinion, the main character in the series. It is just a beautiful in person as you would expect it to be. After getting settled we forced ourselves to a pub to get acclimated to the local culture. (We do sacrifice ourselves for you!) After a red eye flight and a 4 hour train ride, falling asleep that evening was no problem. We were allowed on the set for just three days and we took it upon ourselves to shoot and record anything that moved including cast, crew, tourists, townspeople, babies, dogs, and seagulls. The regular cast and crew all live nearby in houses, lodges, inns for the entire shooting period. Many of them are there for the entire April – August shoot so it is hard for them to get back up to London except on the weekend. Therefore to accommodate them, the shooting schedule is, at least, a 12 hour day – 7am to 7pm Monday through Friday. Having access to everything for those three days was a truly tremendous experience. Our cameraman, Tom Harding, has worked on Doc Martin over the years and his wife is the principal sound recordist for the series. Because of that everyone on set was comfortable with the “making of” crew. Each morning the cast and some of the crew report to base camp which is, in reality, a farm 15 miles out of town. There are trailers everywhere. There are trailers for actors, make-up, costume, editing, production offices and even a breakfast trailer where you can get a full English breakfast. Yummy! Bring on the baked beans!! It is there that the cast is made up and costumed. 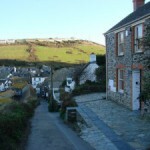 Then they are driven to Port Isaac to shoot their scenes. Also on the farm is a giant barn that has been converted to an indoor studio. It is here that the interiors are shot including Doc Martin’s Portwenn surgery. While the inside of Dr. Ellingham’s surgery is on the farm, the outside door of the iconic location is fifteen miles away which is where we met Martin Clunes. He really does set a great example for a happy filming set. His attitude makes everyone on the crew happy and professional. Martin is all smiles until the director calls “Action!” and then that famous scowl appears. There is lots of lip biting to avoid laughing out loud. We watched multiple takes of a scene. Each scene that is shot is generally done with around four or five camera angles. The crew alters the cameras; the continuity people make sure everything looks the same; the costumer makes sure that a wayward lapel hasn’t moved outside a jacket, etc. They really work hard. The cast, meanwhile, needs to be ready to jump in when it is time and do their lines just as sincerely and accurately on the 15th take as they do on the 1st. In fact, for the three days we were there, we never saw a “blown-take” be the fault of the actors. It was always because of boat or truck noise or a dog barking. Martin Clunes, unlike his character, absolutely loves dogs. In fact, while he was doing his brief scene, one of his dogs was just out of camera range whimpering until his master returned to him. To see cranky Doc Martin turn into mushy dog-owner, Martin Clunes, in seconds was delightful. Many of the scenes that were shot when we were there were at Bert Large’s restaurant. This always poses quite a challenge as it is actually a private residence and the crew is not allowed indoors. It is a very narrow patio which makes things a little snug for everyone. The day before shooting the set designers build the outdoor restaurant structure and the prop masters decorate it with very authentic looking paraphernalia. So authentic, in fact, that visitors to Port Isaac still actually try to book a table at “Large’s Restaurant” and are quite surprised to find out it exists only on their TV sets. The production team actually shoots multiple episodes at once. During our week they were hopping back and forth between scenes for episodes 4,5, & 6 so the cast needed to know their lines for three different episodes. Some scenes were shot in sunlight and some were shot in a misty rain but when you see the final scene it will all flow beautifully. They are magicians. Ian McNeice (Bert Large), by the way, is a real fan of public television and said some marvelous things about PTV for the camera. Fans of Mr. McNeice may be aware that he has also played Winston Churchill in some episodes of Doctor Who (a totally different kind of doctor). He even did a pledge pitch, as Winston Churchill, for us. Great stuff! Many of you submitted questions for the cast and crew, via your local public television stations, and Eric and I asked as many of those as we could. The most universal questions centered around Doc Martin’s personality and what is up with the relationship between he and Louisa. Every cast member had thoughts on The Doc and you will see some of their responses in the special. However we were very lucky to be able to be in Port Isaac during a week that Claire Bloom was present. As you may recall the acclaimed actress plays Martin’s mother and her insights into the character’s personality was a terrific “get” for public television. After each day of shooting our behind-the-scenes stuff we would race back to the production offices where we transferred the interviews and “making of” material from camera cards to hard drives — to free up space for the next day’s schedule. There was always a big sigh of relief when we would see actual pictures and sound from our hard work. This truly was one of the best 72 hours of my life. We worked very hard to grab as much footage as possible for the upcoming special and bonus extras for Series 6 and the DVDs that will be released. The entire cast and crew were so welcoming we wished we could have stayed there for the entire time. But it all started at the top with that married couple, Executive Producer Philippa Braithwaite and series star Martin Clunes. The examples they set makes this a truly happy place to work. I’d sign up to go back in a heartbeat—even though I know those seagulls are loaded and lurking. I wouldn’t dare reveal any plot points but I can tell you that you are in for 8 terrific episodes of the new season of Doc Martin. Hopefully, you’ll get a sense of what we experienced when you see the Doc Martin: Revealed later this year on KERA or your local public television station. Thanks, David. Good to see you immediately found the one and only pub in Port Isaac from the get go. 'Doc Martin Revealed' coming soon to a public television station near you! Please do NOT let this be the last series. There is a huge fan base here in the States and it is growing all the time. I was so excited to be there is June. Keep it going. Super Super Supercalifragilisticexpialidocious there I sais it, keep up the good work!